Getting started in photography is definitely not easy. Especially now a days, everyone with an iPhone thinks they are a photographer. To be clear, I do want to encourage everyone to take as many pictures as they possibly can with whatever device they have available to them. However there is a crucial differentiation between people who simply snap away, and those that understand the core components of what goes into a good image. The good news is, that difference can be bridged with the help of some amazingly well-taught DSLR tutorials for beginners. 1. Let's Start at Square One: What DSLR Camera Should I buy? Free Tutorial! Online creative education company, CreativeLive, does a really great job at presenting complex photography concepts, and distilling them into digestible, actionable DSLR tutorials that you can actually learn from. In this FREE online course, John Greengo helps you understand what makes a good DSLR for beginner, and enables you to make the ideal choice for your interests. If you already have your camera gear, I still recommend watching at least a few of the segments from this free tutorial, as it really helps to understand the differences, limitations, and capabilities of all the different kind of cameras out there, both DSLR and mirrorless. Really just starting out and not sure where to begin? This is the course that will set you on track to calling yourself a photographer. A photographer is someone who understands how their camera works, and knows how to make evaluations of the light and composition within a frame in order to make an informed, calculated decision of how best to take the shot. That is what this DSLR tutorial offers. Just everything. It perfectly covers everything that a DSLR tutorial for beginners should. Just read some of the reviews, or watch the free preview to get an idea of what I am talking about. The video clip below is from this beginner photography course, and offers great DSLR tips for beginners for choosing the optimal aperture, shutter spped, and ISO for your situation. I know it seems like I am promoting a lot of John Greengo courses, but he really is the master at conveying photographic (and in particular DSLR) beginner-focused information. With this top-selling course, fundamentals of photography, moves beyond learning just how a camera works and how images are made, into the discussion of what makes a photograph good. This awesome course is a fully updated comprehensive investigation into how to create beautiful images with your DSLR. This is the kind of information that helps to set you apart with your photos. Now that you have learned all the buttons, settings, and features of your DSLR with the above beginner tutorials, it might be time to get focused on a particular type of photography. If you have seen the rest of my site, you know that my personal favorite style is landscape and outdoor photography. There are other tutorials that I consider to be great landscape photography courses as well, but the reason I have included Mark's course is because it is a perfect overview to the field. Mark does a great job in this course of presenting the necessary skills that separate a DSLR beginner, from a specialist in a given field. This course builds upon the lessons learned from the other beginner tutorials. Learning how to take the photo is only half the battle. Especially if you are shooting in RAW (and I highly encourage you to do so), the ability to post-process and edit your photograph in a high-powered software like Adobe Lightroom, is really where you are able to make the image come out the way you envisioned. In this awesome course taught by professional landscape photographer, Matt Kloskowski, you will learn all the basics of post processing your photos taken with that spiffy new DSLR camera. This is essential knowledge in order to create a finished image that accurately represents what you saw/how you felt when you took the original photo. I love the way Matt communicates these concepts. The reason I have highlighted this course in particular is because he explains in just the right level of detail, how best to use Adobe's platforms specific to landscape and outdoor photography. Watch the free preview to check it out. There are many elements that overlap with the course above, so I would not necesarily recommend both of them. This is more of a general approach, teaching you how to use the many features of the software. My advice would be to watch the free previews in both classes, and then determine which of the two instructor's teaching styles you prefer. What I like about this course in particular, is that it is a comprehensive intro to the Lightroom software which is easily my favorite program for editing my fine art photographs. It is the best way to learn all the components of this awesome program, especially if you are new to it. 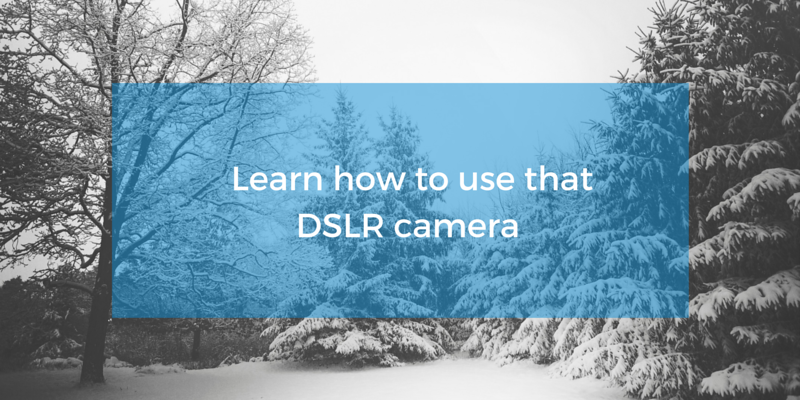 This doesn't fall into the normal category of DSLR tutorials for beginners, but it's such a cool course that I had to include it. While the topic of the use of drones is definitely a controversial one in the pro photography community, there is no denying that when done right, aerial photos can be stunning.